The advantages of outdoor aviary designs are that they can be larger than indoor aviaries and ventilation isn’t much of a problem. The disadvantages however is that if you live in a cold climate then you need to consider heating and providing greater protection against vermin and predators. Stronger wiring is also necessary to prevent escape. 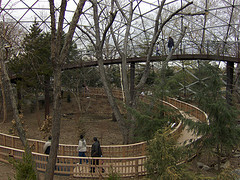 Further examples of outdoor aviaries can be seen here. If you have an indoor aviary inside your home then you don’t usually need to worry about heating. It’s also easier to gain access to the birds, to look after and clean them. You can hold and play with your birds without fear of escape (just make sure all the windows and doors are closed). The disadvantages of indoor aviaries are that you need to think about ventilation more carefully and the potential for more indoor mess and bird dander. They can also be noisey and they can give off a slight smell if you don’t clean them regularly like you should. 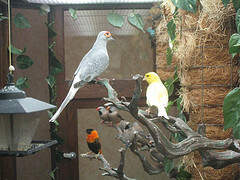 More examples of indoor aviaries can be seen here. Similar to indoor aviaries, a bird room is when you convert an entire room in house for the purpose of looking after birds. With this design it’s important that you have access to a windows which face the sun so that the birds have an idea of what time of day it is. The window is also important for keeping the birds ventilated. Some bird fanciers use bird rooms to keep a set of bird cages for breeding purposes along with a small flight cage inside to give the birds exercise. 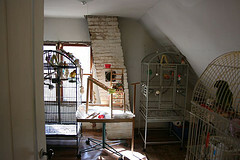 Other bird owners will open up the whole space allowing the birds free flight across the room. This aviary design is perhaps one of the cheapest and easiest to construct. It’s similar to many of the chicken coop designs that are available. Shaped as a triangular prism, this form of aviary has an indoor enclosure, next to which is attached a flight cage. The disadvantages of these are that the triangular shape is difficult for a person to move around in, and it doesn’t give the birds as much room to fly in as a normal rectangular shaped aviary does. 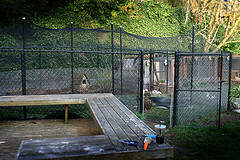 Walk in aviary designs usually have a double door, especially if it is an outdoor walk in aviary. This double door prevents any escape by the birds. It works because before entry into the second door is used, the first door is closed. Of course the major advantage of walk in aviary designs is that you can touch and hold your birds if you need to. When you train them to become familiar with this activity you can teach them to feed out of the palm of your hand. Decorative aviary designs are beautiful to look at, and some people buy them as furniture, without holding birds in them at all! Old and vintage bird cages are particularly popular items to purchase. However, if you’re buying them for the purposes of holding birds then remember to consider functionality first, instead of their aesthetic appeal. 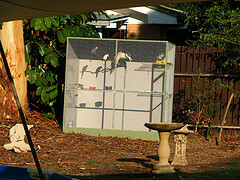 You and your birds will welcome the decision later on when you have to clean and maintain the aviary. I doubt you’ll be building one of these, but I thought I’d include it anyway. Super-sized aviaries are usually built for zoos and special bird parks. They can be the size of buildings, with great poles and masks holding up the netting. They usually hold a variety of exotic species and have several bird keepers maintaining them. If you would like further information on aviary designs and how to plan and construct your very own aviary then please check out my book by clicking here.